Christou’s musical success started in 2006 with local shows under the label F.A.M.I.S.H.E.D. 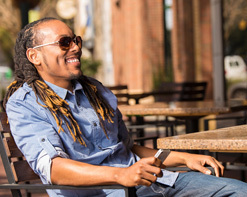 Ent., and then grew in 2010 with a feature in fellow SC artist Kenny Kane’s single “Fly Away,” which won an SC Music Award in 2010 for Single Of The Year. Christou’s career then grew with singles like “Gamecocky” and “Quiet Storm” which both showcased his original style and songwriting abilities. His influences like Michael Jackson, Marvin Gaye, Prince, and Tupac are all indicators of his broad musical range. Now, under his own independent multimedia label Omni Empire, Christou is making waves with his music, acting, and stellar music videos. “Enjoying Life” is not only the perfect phrase to summarize Christou’s current situation, but it’s also the name of his brand new music video. Directed by Uzoma “Uzi” Udogwu, this video is a visually stunning blend of classic musical taste and contemporary R&B style. Shot in black and white, the video depicts Christou and friends exploring the city nightlife and simply enjoying life. It opens with Christou playing the piano and showing off his vocal talent in solidarity, until he gets an invitation to come out through a phone call from “Moon Night Club.” We get it Christou, you’re a popular dude. The rest of the night plays out with jamming, walking the city streets, and performing in front of a loving crowd. It’s the perfect recipe for a night of celebrating life. We’re thrilled to be working with Omni Empire and Christou DaKeeng on this compelling and wonderfully crafted music video. Whatever we can do to get the “Enjoying Life” music video into your programming, please let us know! For more information please contact Andy Gesner and the HIP Video Promo team at (732)-613-1779 or email us at info@HIPVideoPromo.com or visit www.ChristouDaKeeng.com for more info on Christou DaKeeng.